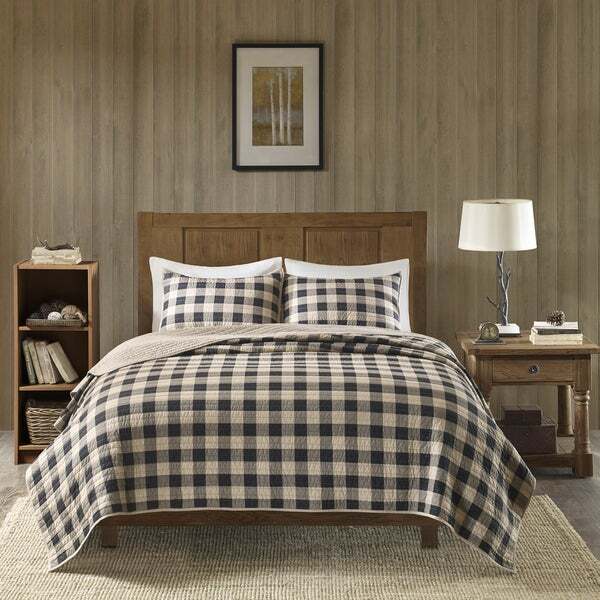 This Wool rich quilt set features a classic buffalo check pattern and reverses to a solid color. Made from 100-percent cotton this lightweight quilt is soft to the touch and can be used year round. Great quality. King is plenty long enough to hang down sides of King bed. I bought this set for my king size bed in our log cabin. Wanted something rustic looking. This set is perfect! It is oversized so it amply covers the mattress and the shams are king size. Many sets that I considered were smaller and the shams were only standard sized. Love the color and the quality. Love it. Looks great. The colors are perfect. Just what I wanted and the quality exceeded my expectations. I ordered a King size for me Queen bed so it would be generous and it fits great. Plenty of quilt. It did have an odor but I just aired it our for a couple of days and it is wonderful. Thank you. 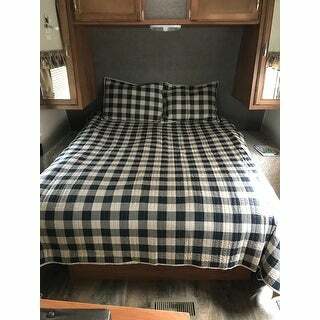 Bought this quilt set for our travel trailer to replace the polyester one that came with it. The fabric and stitching are both great quality and the shipping was much faster than expected. Very happy with this purchase. 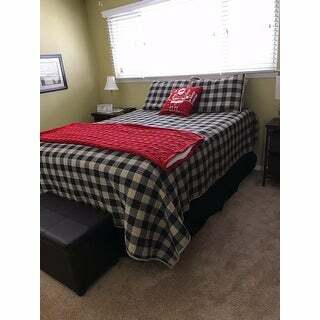 Love this quilt set, looked great with my fall decor and now Christmas. Loved the color and the King fits great on my queen bed. Love that the comforter is large enough it covers the bed good. Not skimpy on the sides. Good quality material. Please with this purchase and will buy more if this brand in the future. Love the color too. Very nice set, not too heavy. 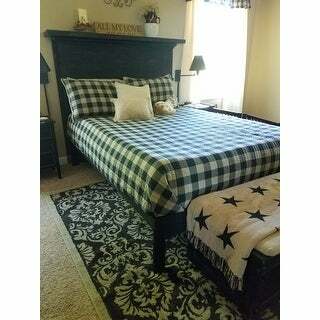 Very pretty buffalo check print, especially for fall/winter decorating. Washes well, would’ve give 5 stars but fabric is a little stiff even after washing. Would purchase again. Extra long. Excellent quality. Washes nicely. Nicely made. Color more tan then beige. Excellent quality. Exceeded my expectations. Love my new comforter! A good heavyweight for winter months. I bought this for summer but have put it away until Fall. Colors are very nice and seems to be well made. I would purchase again. "Do You also sell the sheet set?" "Are the colors tan and black?? How would you describe the colors?" This quilt is tan and black.